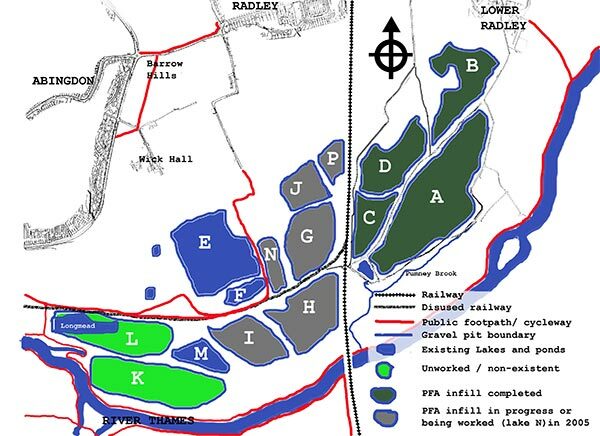 This map shows the status of the Lakes and Gravel Workings in July 2005 with the designations used prior to and during the 2005-2008 campaign to save Thrupp and Bullfield Lakes. Lakes A, B, C, D were filled with ash prior to 2005. Lakes G, H, I, J, P were in process of being filled in 2005. H & I have been merged as have J & P. Ash disposal at the Radley Lakes has now ceased. Lake M is a small shallow lake threatened with reexcavation under the ROMP proposals submitted by J Curtis & Sons in September 2012. Lakes E and F were threatened with being filled with ash in 2005. Lake E (Thrupp Lake) is now managed as a community nature and recreational site by the Earth Trust. Lake L1 is worked. A small lake (Longmead) now restored, remains in the NW corner. The remainder of Lake L (L2, “Bruney Field”) is as yet unworked. Lake K (“Nyatt’s Field”) is another unworked gravel area. From Barton Lane: park at the end of Barton Lane by Sophos and Longmead (L1) and take the public footpath (byeway No 9) which proceeds around Thrupp Farm and cottages to the north, or take the cycleway along the old railway, which passes the farm and cottages to the south. Cycleway and footpath meet again at the level crossing to the east of the houses. Continue straight on, taking either byway or cycleway. Bullfield Lake (F) is shortly on your left. A wooden gate on the left hand side of the byway leads to a path along the western and northern shores of Thrupp Lake to ‘Sandles’. At the SE corner of the Bullfield, byway and cycleway merge and head north. The larger lake, Thrupp Lake (E) is north of the Bullfield and on your left. There is a viewing platform, and a wooden gate just beyond leads to ‘Sandles’ garden where there is an information board and the Lily Shelter, from where a footpath continues anticlockwise around the lake. From Radley: proceed down Thrupp Lane past Tuckwell’s as far as ‘Sandles’. Take the left turn. (Parking beyond is limited, so it may be best to proceed on foot.) Just beyond ‘Sandles’, Thrupp Lake (E) is on your right and there is a gate leading to the Lily Shelter and a path around the northern and western sides of the lake. Continuing along the byway, the smaller Bullfield Lake (F) is on your right. The byeway turns right and follows the southern shore of The Bullfield and carries on towards Abingdon. The cycleway follows a slightly more southerly route along the old railway line. The footpath returning around the other two sides of the lakes can be accessed via a wooden gate on the right hand side of the byway just beyond Bullfield Lake. The first name refers to modern usage. Thrupp Lake has also been previously referred to as The Big Lake and Sandles Lake (after the house that stands on its shore). The name in parenthesis refers to the historic name of the plot or field prior to gravel extraction taking place. 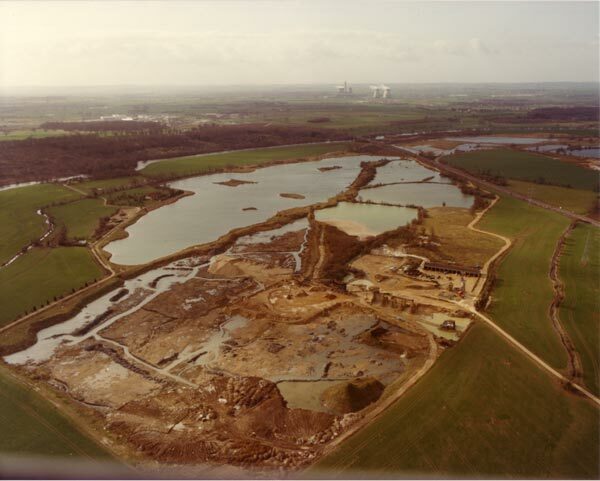 The lakes in 1982: Click here to see aerial photographs. 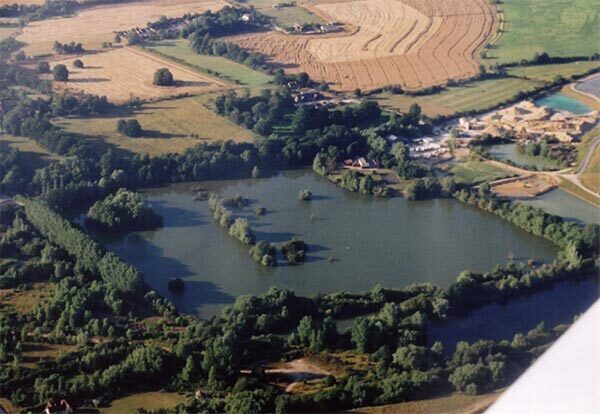 The lakes in 2005: Click here to see aerial photographs. 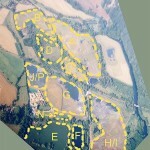 This map shows the letter designations of the Radley Lakes as they appeared from the air in July 2005.